The sea, the sun, and a great game of solitaire! What more could you ask for? 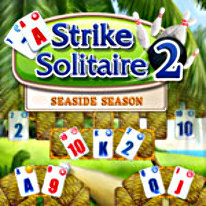 Strike Solitaire 2 is a unique fusion of bowling and solitaire set in a lush country hotel. Featuring 120 levels of entertaining gameplay, unique gold card-pins that add exciting variety to the game, a fun, jaunty soundtrack and gorgeous, bright, sun-drenced graphics, Strike Solitaire 2 is sure to appeal to fans of both solitaire and bowling!